Recently I discovered a flattering, albeit old pair of jeans in my closet. At some point they became unflattering and became painting jeans. I am not sure when they started fitting again, maybe styles changed or maybe I am just in the right point of my ever changing body (four kids has caused me to be many sizes over the last few years).﻿ Whatever the case may be, I like them! 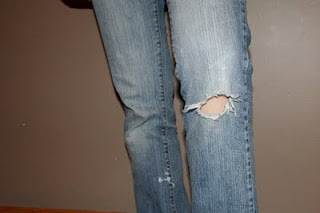 I did have one large problem, the growing hole in the knee. That is not very cool, especially if you want to set a good example for your children. The good news, worn jeans are stylish, in fact you pay more for worn jeans in stores. Another great thing, I have mended many pairs of pants for my children over the past few years so this was an easy task for me. I did not use a tutorial, but if I you want to see what I did, it was just like this. Much better, worn, yet no knee poking through!